Let's take a look at simple 3 Core deckbuilding, and at the ten different Roles a player can select for his clan (or have selected for him, for organized play). Bear in mind, we already have one role selected for Winter Court that cannot be selected again, and eventually (Winter Court 2018) we will get an additional role for a brief period of time. Readers from the future, please note, this is October 2017 that this is being written. Click Here for up to date Organized Play roles. This topic was suggested by Dragon Strategist - and beautiful tattoo'd monk - Mrs Biggs, who gets to sleep while I write this because I am working nights this week. You have two types of roles with 5 elemental flavors each to select from / have selected for you. Each type of role confers a different bonus, with the element determining the element of some of these effects. Keeper of [Element] - Increase your deckbuilding influence value by 3. Reaction: After you win an [Element] conflict as the defending player - gain 1 fate. Right now this is seen as the defacto role, to the point where all 5 Keeper roles have been selected and FFG placed a new rule that the split going forward would have to be 4/3. 3 Additional Influence is the big reason for this, as influence and "splash" - bringing cards from a single different clan - are often the only ways to get specific effects into your deck. Having 13 instead of 10 influence allows you to take additional copies of high influence cards, where before maxing out a single influence 3 card would almost lock you out of anything else. Who is almost comically easy to get into play - just don't buy him, and discard him when refresh phase begins even if you don't get the ring this turn. Then he just pops out whenever you when the correct elemental ring! All by himself he's not that good, but he's a free 1/1 (that hangs around for a bit) for doing what you were going to do anyway. But because he cycles your cards without losing out on his ability (being able to get back into the game from discard), he's 3 cards you can throw into the dynasty deck without worry. Seeker of [Element]: You may replace 1 province of any element with an additional [Element] province while deckbuilding. 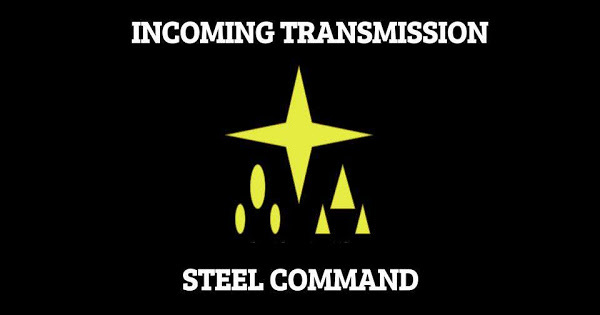 Reaction: After an [Element] province you control is revealed - Gain 1 Fate. The big effect is still the first one. Putting in 2 of a specific element of province is a potentially very powerful ability, as is removing 1 element you don't want to have to bring. Depending on your clan specific province and rules about revealing your deck list to your opponent before play, it may force your opponent to play cautiously, respecting a province that you "might" have. The second effect just plays into the first, with you gaining 1 fate every time the enemy flips your province with the appropriate element. Who is... less amazing than the Keeper Initiate. First you'd have to spend 2 fate for a 1/1, then while he's out collect the correct ring, all to get a selective card draw. Still, there is no limit on what you look for, so his card draw is strictly better than a single draw, so not terrible. 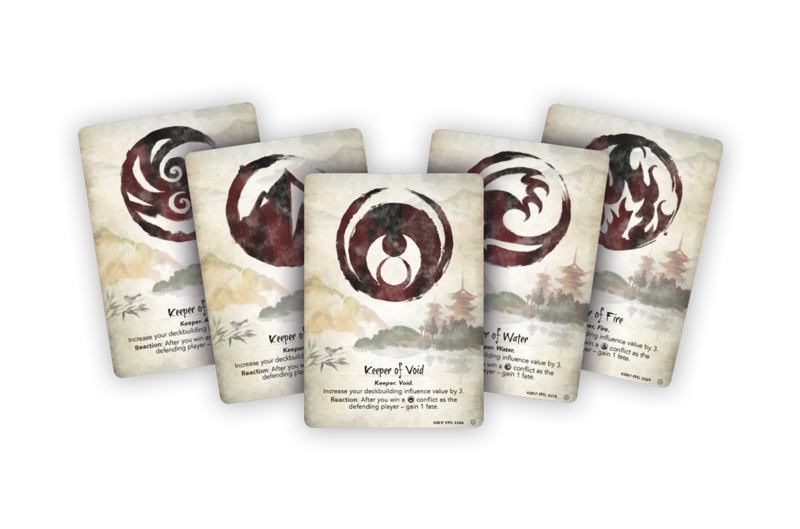 After new roles are chosen at the Winter Court, we will quickly receive a bunch of new cards for each faction, with one Keeper and one Seeker card in each. Interestingly, most of these cards (with the Crab and Dragon Keeper cards being the two exceptions) are "splashable" conflict cards, so even if they are locked out of the clan that they belong to, they would still be available for a different clan with the correct role. Crab's choice of Keeper of Air initially feels a bit odd. Seeker of Earth seems the more natural choice, giving them two Earth highly defensible provinces, including their faction specific "Defend the Wall" which lets them turn a defensive battle into effectively an offensive one. But they must have wanted the 3 influence for the splash when selected. Going forward, Pathfinder's Blade also suggests a good Seeker ability for when they do go offensive, letting them scout (and potentially break) enemy provinces without taking a nasty surprise like the Art of Peace or Restoration of Balance. If Keeper is selected, Crisis Breaker can move a berzerker - including himself - readied into the fight. Another defensive option for a faction with a lot of defensive options. I'd try Seeker of Earth if at all possible. Splashing away with a Keeper role, Crane probably wants to stay with some sort of Keeper role after Worlds. The Art of Peace is good, but the neutral Air provinces aren't so amazing that you would feel the need to definitely have another. Test of Skill is a random card draw, where maybe you get two, maybe you lose 3 (or 4!) cards - hard pass. 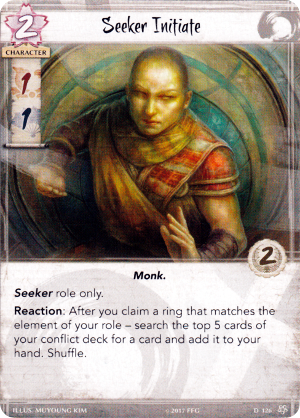 Disdainful Remark is actually a pretty good defensive card for either saving a province in danger or forcing your opponent to dump his hand to get something that should have already been lost. Definitely stick with a Seeker if possible. First pick, and they went with Void. Probably a pretty good call, as attacking Void with the first attack of a new game is becoming fairly common place. Protect your fate, and gain one besides! Oh, yeah, also influence bonus. I don't think Dragon need to run dual Fire provinces, though Restoration of Balance & Night Raid would make a nasty 1-2 punch. Looking at the future, The Stone of Sorrow looks absolutely amazing for locking your opponent out of collecting fate, giving you an economic advantage. To be honest though, I'm mostly looking at it as the *other* thing a Seeker is going to splash Dragon for, once they max out their "Let Go"s. Northern Wall Sensei could be useful, but it's an expensive cost for a 2/2, and his ability is an action which limits him to being your first action on defense, or your opponent uses what they were going to do anyway. All in all, I'd say Seeker of Fire, Void, or Water. Oh, hey, influence. And an efficient 1/1 that gets better if you honor it, which is right up Lion's alley. Lion probably wants yet another Keeper role, as Guard Duty is yet another great way to honor someone. Time for War is a way to counter-attack, but requires too many things - a weapon already available, a lost political conflict - decent later in the game. They should probably take Keeper of Fire - dominate the honor/dishonor game! Oh my. Our first actual Seeker. They definitely want to grab their named void province and one of the other two - probably Shameful Display. If I were them, I'd probably leave Earth behind when building my deck - while strong, they don't really give much in the way of economy. Anyway, going forward, have a 5 fate event for reversing a particularly bad wall of enemy characters if they stay a Seeker, or a way to send characters home from a conflict if they go Keeper. Honestly, I think they could choose anything at this point, though Seeker of Air may be their best bet for maximum economy, or Seeker of Water for maximum ring / conflict switching shenanigans. Any Keeper would also work, as I think that Harmonize is a better card in general. Secret Cache is a really, really good province, and being able to sneak it in with a Fertile Field or Manicured Garden is just good business. Going forward, the Oni Mask is a very nice way to shut down something particularly scary, and is free cost to boot, while the Compliment is just more honor loss you can force on your opponent, or utilize for yourself in a pinch. Both are good, and Scorpion is I think just going to be mad that they can't be Seeker of Air again. Unicorn, the clan that caused the 4/3 split rule to take effect. My ponies went and grabbed the last Keeper role left on the board, leaving 3 Seekers still available. I hope that was just so that we would be less likely to be locked out of a Seeker role going forward, as I think Endless Plains works best when your opponent is forced to play around it for the whole game. Doesn't matter if we have Seeker of Water, or Seeker of Anything really. Just give us the option to make our opponents think we MIGHT still have Endless Plains out, unrevealed. Speaking of which, Talisman of the Sun, which you would think you could use to pop Endless Plains, doesn't actually work with it as Endless Plains is a reaction on an attack declaration, not a reveal. 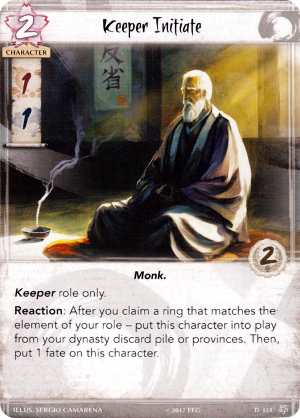 So, Talisman of the Sun is still a very, very good Keeper role, and Crab / Lion are going to have a lot of fun using it if they wind up with a Keeper role, splashing it in with the Captive Audience they are taking. Chasing the Sun on the other hand will make for a pretty good early game scouting event - bounce around flipping things as you go. With an Iuchi Pathfinder, you can know 3 of the 5 enemy provinces for 2 fate and a single political conflict. Not bad. Some minor use bouncing an attack into Endless Plains or Secret Cache as well. Well, that's it for the Roles. We'll probably talk about them again later when they are set for the upcoming year. I disagree with your opinion that Seeker is best for Crab. Crab just gets too much utility out of having a reusable Initiate to fuel their sacrifice engines. I also think Crisis Breaker is very good since he has built-in anit-bow and anti-send home. In addition, choosing Air helped Crab's dishonor game. Although I think Earth or Fire would also support it while also being more versatile.